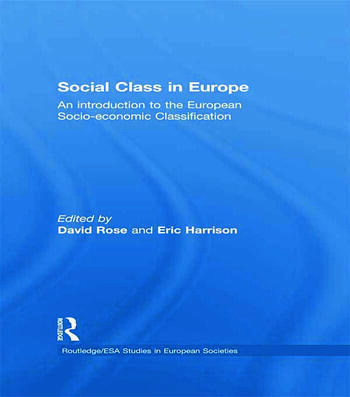 David Rose is Professor Emeritus of Sociology, Institute for Social and Economic Research, University of Essex. He was academic convener of both the ESRC Review of Government Social Classifications, which led to the creation of the National Statistics Socio-economic Classification, and the of ESeC project, and has published widely on the topic of social class in the UK, including Social Class in Modern Britain (with Gordon Marshall, Howard Newby and Carolyn Vogler, 1988); Constructing Classes (with K. O’Reilly (ed. ), 1997); A Researcher’s Guide to the National Statistics Socio-economic Classification (ed. with David Pevalin, 2003); and The National Statistics Socio-economic Classification: Origins, Development and Use (with David Pevalin and Karen O’Reilly, 2005). He is an Academician of the Social Sciences. Eric Harrison is Senior Research Fellow in the Centre for Comparative Social Surveys at City University London, UK. He was the assistant convener of the ESeC project, but now works in the ESS coordination team. His principal research interests lie in social stratification, social inequality and comparative research methodology.